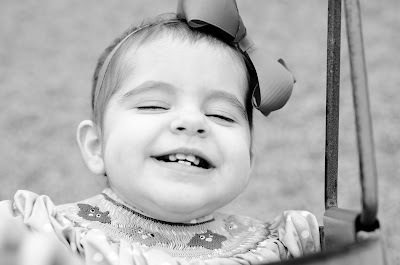 Blessings, Miracles, &Thoughts in Between: Sweet Smiles!! 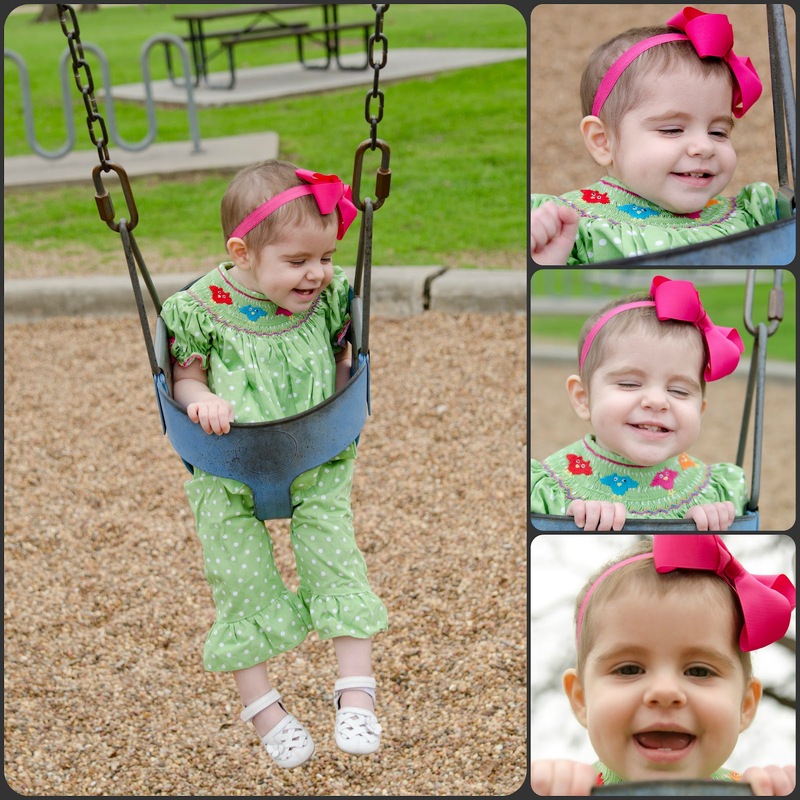 Kate had a great clinic appointment last week and we got some awesome news! She no longer has to wear her mask when we are outside (as long as we aren't in a crowded place)!! We took full advantage of the one non-rainy day we had last week and headed to the park, sans mask, to enjoy the swings and play ground! I may have carried a HUGE container of Clorox wipes with me...and I may have spent nearly 15 minutes scrubbing the swing before putting Kate in. Anything to keep germs away since her mask wasn't there to stop her from putting dirty hands in her mouth. Kate had a blast. 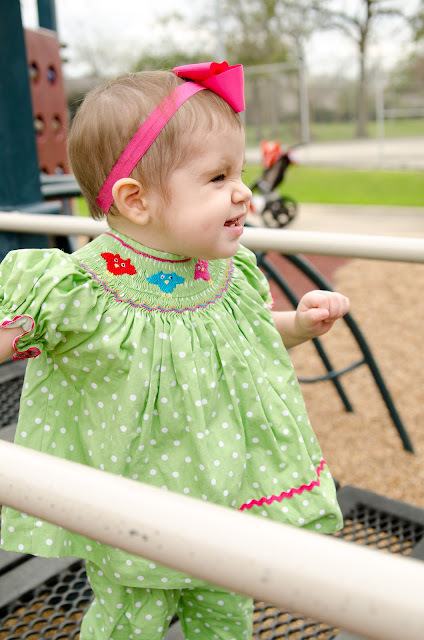 I think she was shocked to not have her mask on but she loved the park - and I loved witnessing her sweet, unmasked smile while she enjoyed a normal toddler activity. I'm not going to lie, I had tears streaming down my face as I pushed her in the swing. It was so surreal to feel normal. To be doing normal things with Kate. To not draw any extra attention due to a bald chemo head or a huge mask on her face. We looked like a normal momma and baby girl enjoying the beautiful weather. I can most definitely get used to normal in our lives! I am so incredibly thankful that we have made it this far. 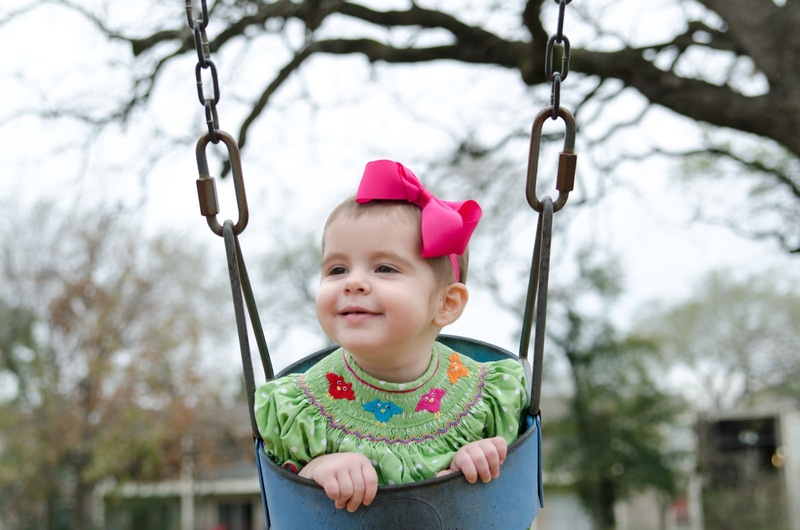 Six months ago today, Kate was readmitted to start chemo in preparation for her transplant. It has been a long, hard six months but seeing her sweet smile has made every struggle, tear, and set back worth it. And, as always, I am so thankful for everyone who has supported us, prayed for Kate, and encouraged our family as we've walked this difficult journey. Her smile is contagious! Too cute! Loved every second of that post!!!! Look at that beautiful smile! I am soooo behind on your blog! She has gotten so big too! Hope your pregnancy is going great! Love it! Miss you guys! 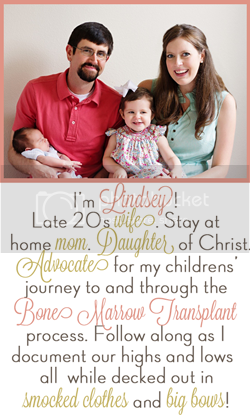 So this post brought tears to my eyes (I admit I am hormonal!). 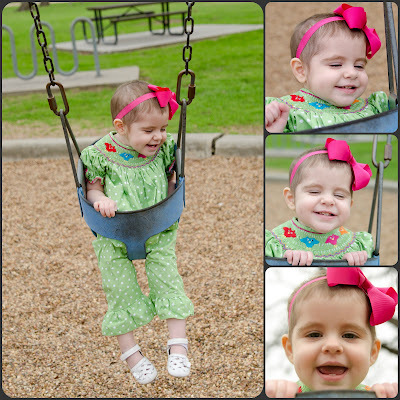 To see that sweet smile that has been behind the mask in the other park pictures is a testimony to God's faithfulness. She is beautiful!! And her smile is so contagious. So precious! You've both been through a lot over the past six months. So wonderful to have a special day for the both of you! What a memorable moment in your life! She looks just beautiful enjoying the park with no mask. I would've been letting the tears roll as well! what a precious smile!!! so happy for your girl! This makes me so happy to see. It reminds me of when Ben was able to go out for the first time. Since we were in St Louis, MO, we took him to the riverfront and the Arch so he could run around. It was so nice to see that he could be "carefree" to a certain degree. I wanted to tell you that you need to check out ksdk.com (a news station in St Louis). They have an article that tells us federal regulators have approved new supliers for Methotrexate and another cancer drug. It also says that the "FDA from now on will require companies to notify of any issues that could result in further drug shortages." I like to think that you informing us had a little to do with them taking action. Thank you for letting us know and be a part of a solution. I like to think that under the circumstances, we are two of the luckiest women/moms alive.